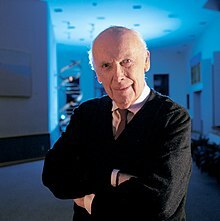 James Dewey Watson (born Aprile 6, 1928) is an American molecular biologist, geneticist an zoologist, best kent as ane o the co-discoverers o the structur o DNA in 1953 wi Francis Crick an Rosalind Franklin. Watson, Crick, an Maurice Wilkins war awairdit the 1962 Nobel Prize in Pheesiology or Medicine "for thair discoveries concernin the molecular structur o nucleic acids an its signeeficance for information transfer in leevin material". ↑ 6.0 6.1 6.2 6.3 6.4 "Chemistry Tree - James D Watson Details". academictree.org. Archived frae the oreeginal on January 22, 2015. ↑ Anon (1993). "Richard J. Roberts - Biographical". nobelprize.org. Archived frae the oreeginal on March 4, 2016. Retrieved February 28, 2016. ↑ Ferry, Georgina (2014). EMBO in perspective: a half-century in the life sciences (PDF). Heidelberg: European Molecular Biology Organization. p. 145. ISBN 978-3-00-046271-9. OCLC 892947326. Archived frae the oreeginal (PDF) on August 24, 2016. This page wis last eeditit on 15 Apryle 2017, at 14:14.